The kit comes with a laser cut card roof some .070″ thick. I decided to make my own though for a couple of reasons – 1) my model sits on a base so the underside of the roof will be visible since you will be able to see ‘up’ to the overhang. I thought that exposed rafter tails would be nice and 2) I wanted the roof removable so I could add lighting, interior of a sort and so on. There are a multitude of ways to approach this but I wanted to try something different – yes … I am slightly mad. The underside of the roof would be visible boards – open to the elements. This is to be a turn-of-the-century structure (c.1900) so no closed in soffit. Since it would be only really visible if someone stoops over a bit I didn’t feel it worth the time and effort to go crazy with it – and thought I might be able to print the boards (I have pushed using cardstock buildings after all). 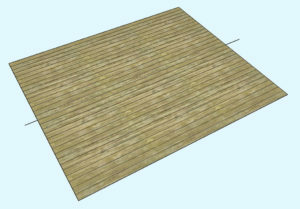 I quickly created the roof underside complete with boards in Sketchup. I printed this off and glued the print to a heavy cardstock – watercolor paper using spray adhesive. This gave me a sub-roof about 0.022″ thick. 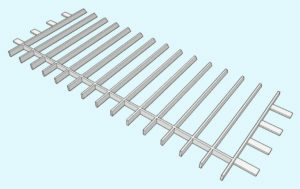 In O scale this is about an inch thick – “good nuff” to represent boards for a scale thickness. Next – this is paper and cardstock after all .. spray a good coat or two of a matte Lacquer to seal the surfaces. 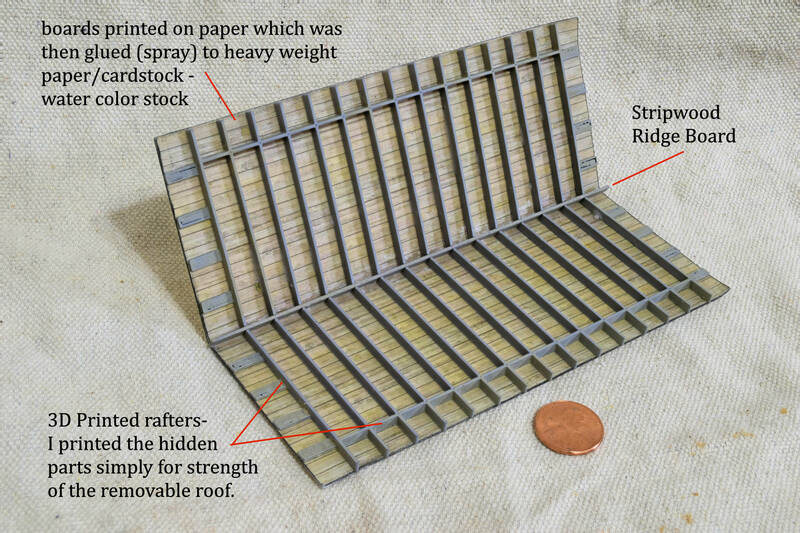 I had originally intended to print guidelines on the boards print and use stripwood 2″x6″ rafters etc. 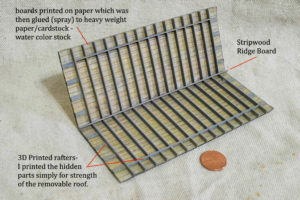 I then thought .. “hmmm .. wonder if I can print everything .. rafters/rafter tails, ridge board etc? So .. back to Sketchup. I think this will work. I need to find the right size ridge board in my scrap box, paint the rafters a weathered wood color to kinda-sorta match the roof boards and then sponge on some trim color and glue everything up – our glue up prior to sponging do the underside with the sponge too. Decisions .. decisions. Well. How does this all go together? I have cats and have long since learned that would swiftly lead to an expensive learning experience. I prefer an easier route .. 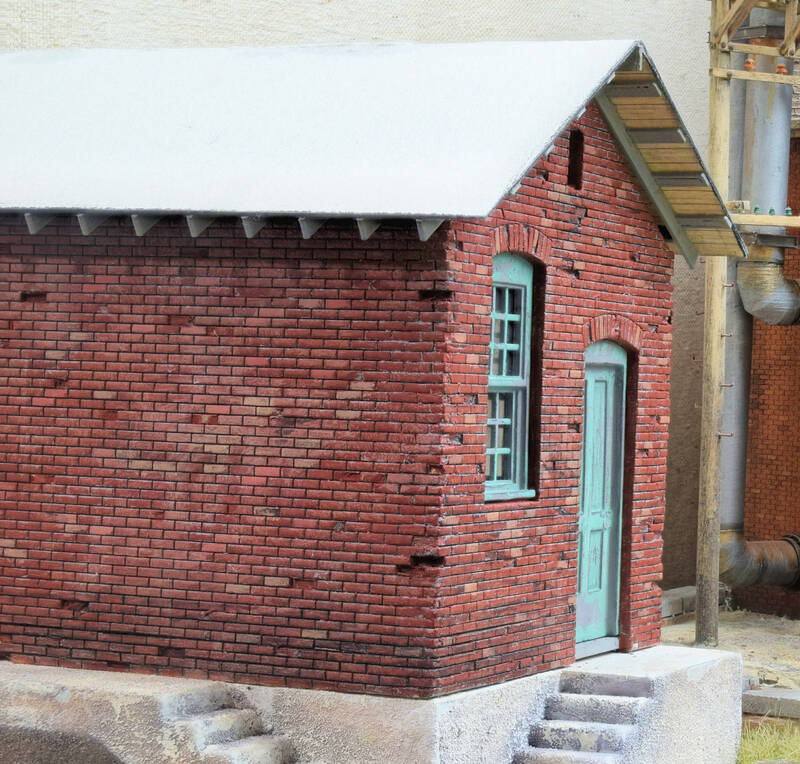 I wanted to try something new when I wanted to create a removable roof for my O scale Rusty Stumps pump house. 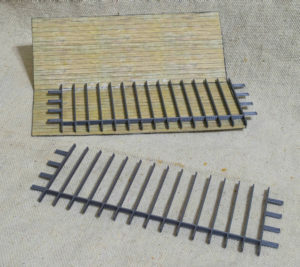 To repeat – I printed the roof deck on paper, 3D printed the rafters (etc), a piece of stripwood for the ridge board. It came out pretty well .. other than it is somewhat ‘bendy’ at the ridge – but all in all fairly happy with the result. I’ll address the ‘bendy’ bit .. well .. in a bit. Finally got back to working on the roof a bit last night – 3d printed rafters (etc) glued to the cardstock sub-roof .. this photo is just a check-fit .. need to do some clean-up filing on the structure yet I am getting a bit of a problem with the roof trying to ‘un hinge’ which is reasonable. I need to come up with some triangular gussets to fix that. Still need to scratch the vent at the top .. I think my cat ate the ones in the kit.